This house was perfect for our family of 4 and my in-laws, so there was a total of 6 of us. We saw wildlife each night. The house was situated up in the trees and gave us a nice reprieve from the busyness of life. There were no neighbors close by so it is very private. Perfect for our week in MT. Thank you!! Hyalite Gem was one of the most beautiful, well appointed and clean rentals weve ever stayed at (and weve stayed at many). Cant say enough great things about this company and the rental we stayed at. Hyalite Gem was one of the most beautiful, well appointed and clean rentals weve ever stayed at (and weve stayed at many) Zach, with Stay Montana, took the time to show us different rentals as we were doing an extended stay. He even helped us with finding an awesome realtor (TJ Anderson with ERA). THANK YOU, THANK YOU! On-line, everything was very easy to do, from reserving to asking questions. At the rental we had to get someone to come out and dump the trash for us. He was very nice and polite and asked if we needed anything. Very professional! We stayed a week at the Hyalite Gem property during our daughter's graduation from MSU. The interior of the house looks just like the photos. Very comfortable and cozy. The views are amazing from every window and the covered deck was a great place to grill and watch the sun set. There was plenty of room for parking and enough yard to throw the frisbee or football. The area is quiet and peaceful, perfect! We can't say enough good things about Zach & Sarah, the management team from Stay Montana, who helped us prepare for our family vacation in this beautiful, well appointed and comfortable home. They made sure we had everything we needed before and during our stay. They went above and beyond our expectations. We were fortunate enough to have beautiful weather, and loved the ski in and ski out feature of the home. Second there and it was just as good as the first! Very relaxing atmosphere with a gorgeous fireplace and hot tub a few steps away. The set up works very well for gathering the entire group in the great room or for meals while offering private space if the group wants to enjoy many different activities simultaneously. Everyone I had contacted were very polite and professional. Thanks for your guys hospitality once again! It was an amazing house, in a great location. It had more than enough space, loved the fireplace as well as the beautiful furniture and unique dcor that was around the house. It was perfect, clean and had everything we needed and more. It felt like home. The host responded quickly and provided good recommendations. The home was better than I expected and the pictures don't do it justice. The host responded quickly and provided good recommendations. 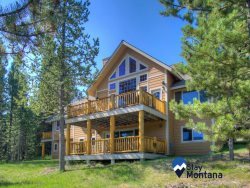 It is in a great location and about 15 min from Big Sky. We did appreciate the hot tub. Fantastic! Unbelievable property, perfect ski in ski out with all the amenities. We could not have been more pleased, everything was handled perfectly. Zach does a great job and met us when we arrived. Just excellent, thanks so much for the unforgettable ski vacation. The place was wonderful and in a great location. Zach helped us out when we needed him. We can't wait to return and would definitely stay there again.